Version 2019 introduces a new rules system for the Condition action. The interface is easier to use than the old system which was based on VBScript expressions. You can include any number of rules and trigger if any or all of them succeed. 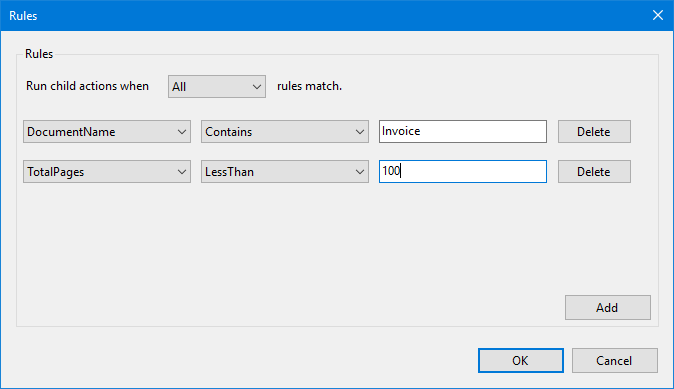 The rules dialog is displayed automatically when you add a new Condition action or can be accessed by clicking on the elipsis ( ) button on the Rules property. Existing VBScript expressions are automatically included in the rules when you upgrade. The Options dialog has changed to a traditional format rather than being based on a property grid. The maximum log file size has been increased to 10MB (previously it was 1MB). The Reprint action now includes printer status when trace level logging is enabled. Email attachments now have an Attachment Name property that specifies the name as it appears in the message. Backing up the configuration will ask if you want to include the log files and system information with the backup. The template editor supports the Now variable in the preview. Clicking on the service status in the status bar pops up a context menu allowing you to start and stop the service. If the print spooler is stopped then the configuration in Print Distributor is disabled until the spooler is started. Before and After actions have moved to the Tools->Global Actions menu. The GhostScript action now warns if there is no %!PS-Adobe comment in the header of the printfile. This is usually indicates an incorrect printer driver. This is a free upgrade for anybody with version 5.0 or later. For versions 5/6 you will need to re-enter your license code after applying the update.